It’s been a good salmon season so far, and we’ve been eating orange fish a lot lately. One of the cooler things to do when you catch a salmon (or any large fish, really) is to harvest “spoon meat” to make salon patties. Spoon meat is when you use a spoon to scrape down the carcass, leaving it almost totally clean — and you with lots of meat you might otherwise throw away. On a salmon, this meat is unusually fatty, and makes great patties or cakes. 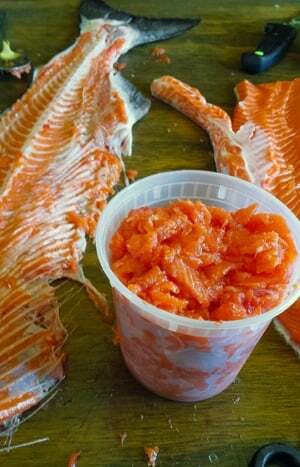 (It also makes a great salmon tartare, too.) 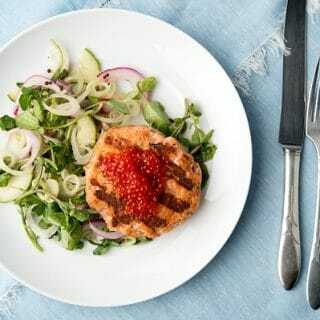 What’s the difference between a salmon patty and a salmon cake? To me, it’s mostly a matter of the binder. Fish cakes to my mind have mashed potato or lots of bread or breadcrumbs in them, where patties are more meat-centric. Possibly it is a distinction without a difference, who knows? It is tricky to make a salmon patty that holds together without some sort of binder, however, so I do use a little bit of torn-up bread and one egg white — just enough to keep the patties moist and together. These still have a good feel to them, though. My salmon patties have a Scandinavian feel to them, with a bit of sour cream and dill. Salmon + sour cream + dill = a perfect combination to my mind. The little bit of sour cream in the patty helps keep it moister; dried out salmon patties are a sad thing, but all too common. 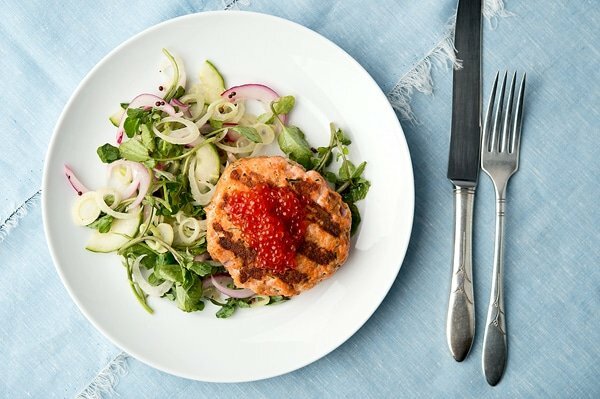 I also go bunless, serve the patties with a zippy summer salad and top everything with a little homemade salmon caviar. It’s as close to spa food as I get: Light, relatively low in fat, clean. This is how I like to eat salmon patties in summertime. It's a light supper good for when the weather is super hot; a glass of white wine, dry rose or a lighter beer like a pilsner or lager is a good accompaniment. You can of course put the salmon patties on a bun and then have a real salmon burger. If you go this route, maybe top the patty with some cole slaw and some mayo or remoulade. Either grind your salmon, the onion and the bread through the fine die of the grinder (how I do it), or pulse it a few times in a food processor. Put the mixture in a bowl and mix in the egg white, white pepper, salt, sour cream and dill. Form into patties. Put the patties in the fridge while you make the salad. Toss the sliced fennel and red onion with a little salt and the lemon juice and let it marinate for 20 minutes. Cut the cucumber lengthwise and remove the seeds with a spoon. Slice it thinly and add it to the bowl with the fennel and onion. Stir in the pickled mustard seeds, black pepper, sugar and sunflower oil and set aside. I like to grill my salmon burgers. 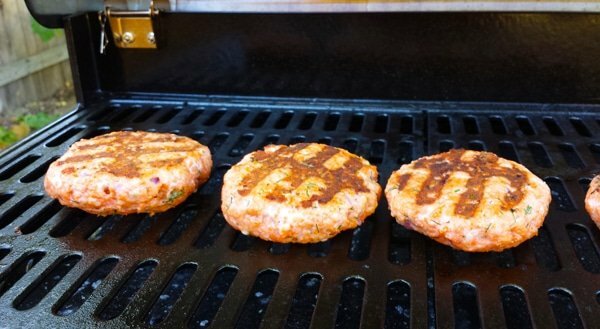 Get your grill very hot and scrape down the grates with a wire brush. Dip a paper towel into some vegetable oil and use tongs to wipe down the grill grates. Set the salmon patties on the grill and cook with the grill cover up for about 3 minutes. Flip and grill for another 3 minutes or so. When you are ready to serve, toss the watercress in with the rest of the salad and serve with the salmon patties. Top the patties with the salmon caviar if you have it. You can find nearly 100 recipes for salmon and trout here on Hunter Angler Gardener Cook!